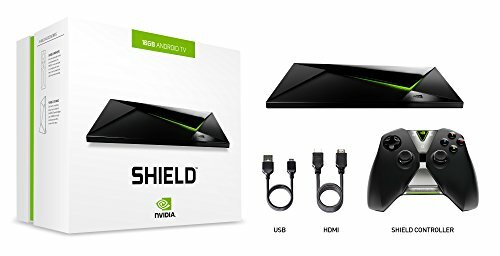 This week we are going to be reviewing the Nvidea Shield Android TV Box. If you’re not familiar with this device, it is a game-streaming, media-playing, Android TV-powered console. It’s manufactured by NVIDIA, who are a tech company that’s been in the gaming industry for as far back as I can remember. They primarily make video cards for PCs and consoles, so it’s pretty interesting to see them come out with a console of their own. Apart from being made by NVIDIA, what also sets this box apart from other current Android TV devices is 4k video playback. It even allows a Dolby Digital 5.1 and 7.1 pass-through, so it’s a very well-rounded media player. As standard, it comes with a Bluetooth controller which we’ll see in a bit, but there are also additional accessories that can be purchased like the Shield remote for £39.99 and the Shield stand for £25.98. The remote has all the same functionality as a controller, minus the ability to be used for gaming, so I’m not sure why you’d want it, but it is an option if you’re interested. You could always opt for one of these other controllers that we reviewed here. Firstly there is the device itself. It has an origami-style look to it, very cool looking device. On the lower right, we have our power button. It’s covered by a little protective sticker. The glossy area at the top also has a protective sticker. Looking at the front, there’s not much going on, but there is an IR port to the right. And then, on the bottom, not much going on here either. This area is kind of textured but there’s no rubber legs or anything to really keep it stable. And the sides don’t really have anything. Most of the action is occurring at the back of the device. Starting from the left, we have a heat sink, there’s a micro SD, micro USB, two USB 3.0s, gigabit Ethernet and an HDMI 2.0 port. There’s also a power port for our nineteen-volt power supply. Other than that, it feels nice in the hand. It has a nice weight to it. It feels very well-made. And let’s take a look at what we’ve got under the lid. Next out of the box we have our Shield Bluetooth controller. If you’ve ever used a Shield handheld device, it’s the same controller that comes bundled with that. It’s definitely got a nice feel to it, it’s kind of bulky but it feels good. It’s got a D-pad, there’s two analogue sticks which roll nicely, and we have our face buttons on the right. Towards the centre, we have a home button, a “start” button and a “back” button. And then on the middle, there’s the NVIDIA power button to turn the controller on, and a microphone. Looking at the bottom, we have a plus and minus for volume, and then at the top we have our shoulder buttons, our trigger buttons, there’s an input for a headset, and a micro USB if you want to connect it directly to the Shield console itself. It has a rechargeable battery. As you noticed, there’s no battery pack, so you should be able to charge it up and save yourself some money on batteries. And all in all, it’s a very solid controller. Underneath the controller, we have our Shield start-up guide, which walks you through how to connect everything. And then there’s also a user guide, if you want to read up on what they have to say about the unit. And then here’s our power supply. It’s a nineteen-volt, 2.1 amp power supply, and it looks like its proprietary. I haven’t seen any piece like that before, so I don’t think it will work with other Android devices but it feels like a very nice power supply. The last two pieces of the packaging are the micro USB cable, which is meant to be used with the controller to charge it or to connect it directly into play. It has some little logos on there to help you remember what it’s for. And then it just connects to the top of the controller and then plugs into the back of the Shield console. The last piece is the HDMI cable. There’s really nothing special going on here, it’s just meant to connect the Shield to your TV so you can output the display. And that’s pretty much it for the retail packaging. So let’s fire this thing up and take a look at what the software looks like. If you’re starting up for the first time, it should ask you to sign in with your Google account and then install some updates for your console and the controller. But other than that, this is the main screen of the Shield console. It, like most other Android TV devices, takes you straight to the Leanback launcher. And of course, like all other Android devices, you can pick whatever launcher you prefer and install it, so it is purely a matter of taste. A great feature that we tried out is the voice search. It’s the main feature of the Android TV platform and, unlike the Forge TV, we can do voice searches with the controller’s built-in microphone straight out of the box. With the voice search, you can pretty much be as specific as you want. You can tell it to do a Google search, open Netflix, play a game, and do a number of other things. I really like that the controller also has a built-in mic since I don’t have to fool around with some weird headset, download an app, or purchase an additional remote. So I think NVIDIA definitely did right by the buyers here, including the microphone in the handset. NVIDIA released forty titles for the launch, which includes a few big ones they were promoting, like Crisis 3 and Doom 3, but those are still in development so this is pretty much what’s available for now. For an initial launch, I would say, its okay. It’s definitely better than the Forge TV, or the games you can find in the Play store. But a lot of these titles are older games. Even with that being said, as a whole, the library is well-rounded. There’s stuff in there for kids, for adults, casual gamers, and then involved gamers. So the game we decided to test was Batman: Arkham Asylum. As a whole, we have no complaints about the user experience. We do have really fast internet and Wi-Fi so perhaps performance may not be as good on a slower set-up, but with a hardwired connection and decent internet, this device had no issues with gameplay as far as latency and responsiveness will be concerned, and pretty much any action we initiated on the controller was immediately acted on the screen. So it was very impressive for a game that was basically being downloaded as we played. Next we had a look at the “Download Games” area. This is basically a marketplace in the Shield Hub where you can purchase additional games. Some of this stuff you can also find in the Play store like Leo’s Fortune, but some of the stuff may be specific to the Shield line of devices, like the Half-Life games. But it’s just an additional area if you wanted to purchase games and download them locally to the device as opposed to streaming them. So, next up we have Netflix. This is interesting because we heard rumours that Netflix wasn’t going to be included on the Shield TV, like it wasn’t included in the Forge TV, but it was the very first update that we got when we powered the thing on. Netflix has the half screen user interface. I’m not really a big fan of only seeing stuff on half of the screen but I guess it helps with keeping stuff neat and organized. A lot of Android stuff has issues with Netflix at 1080p so I was pretty interested in seeing what resolution this thing maxes out at. Netflix can achieve 1080p and it does a good job of playing the video. There’s no noticeable lag or jitter or delay or anything like that. Netflix worked as it should work and as it would be expected. So good job to NVIDIA for pulling Netflix through at the last minute. If you’re not familiar with the Google Play store on Android TV, it’s basically a stripped-down version of the regular Play store with apps that are TV-friendly or that have been approved by Google for use on Android TV. So outside of gaming, there’s some useful stuff on the Playstore. Of course the main one you all want to know about is KODI. This is a big one for a lot of people. I was really excited to see how this device handled KODI. I use it for my media library, to organize everything. I know a lot of other people also do this, so let’s go on and see how it does. The default skin looks nice, and is pretty responsive. However, the stock controller performs a little weird with it. Looking at the system specs, it’s got about 1.5GB of RAM freed up. CPU usage is pretty low. It’s 1920 by 1080, 60 hertz, 33F/PS. Scrolling is very fluid. I feel with the stock controller the speed is kind of limited, at least compared to a keyboard but it scrolls wonderfully and everything looks good. It’s quick to load. Most of these stuff wasn’t pre-cashed, only the beginning part of the library was, so it’s downloading pretty fast and all the artwork is 1080p. So, pretty good job there. After going through a few test clips, I would say video performance in KODI is strong. KODI 14.2 doesn’t even support hardware decoding of HEVC files, but the Tegra X1 was able to software decode the majority of them without issue. So it should be interesting to see how things turn out in the long run. 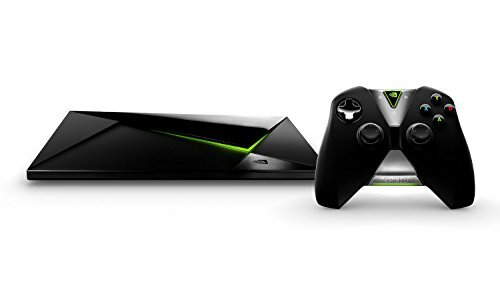 So, that’s pretty much it for this NVIDIA Shield Console review. I think it’s a great device. I know there was a lot of hype built up around it and it’s hard to live up to hype, as seen with the Razer Forge TV, but the NVIDIA Shield Console doesn’t disappoint in any aspect, at least none that I’ve discovered so far. So, hats off to NVIDIA. They killed it with this device. I think they’re really going to have a money-maker here, and it kind of set up the standard or the bar for other manufacturers who produce Android TV devices. It’s going to be hard for people to beat this type of device. Its hardware specs are very future-proof. It has game streaming, which is something that’s manufacturer-specific. It’s not a feature of Android TV. So there’s a lot of things that this brings to the table that other manufacturers are going to have to compete against, and it should be very interesting to see what they come up with in the future. So that’s all I’ve got for you in this review, guys. I hope you enjoyed it. Hope you got what you needed. Let us know what you think in the comments. Possibly the best box available on the market at the moment. A little more expensive, but it it definitely worth it when you compare the build quality and performance with other devices. This console is my favorite because of the 4k video playback. 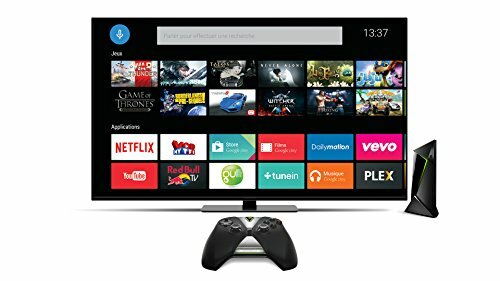 I recently purchased a 4k TV and I was reading reviews to find the latest android devices that work well with my television. The picture quality is 2nd to none, and if you do not break the bank by doing so. Adding on to the fact that this console is built for gaming is another plus in my book. Knowing that the KODI app is available on this device is the final big plus for me! Love this box, cant really fault it. Streams everything I want perfectly. Haven’t played many games on it yet thought. - CONS: Nothing just yet. Thanks for your review David!